After a crazy first round of voting,1 we’ve narrowed our contenders in half. Some pre-contest favorites bow out early while some upstarts notch impressive prequarter victories, perhaps portending future success. The second round of voting starts now and closes on Wednesday, January 4th, at 5 PM Eastern. The semifinals voting will commence on Thursday. In one of the more surprising2 first round upsets, Mehta advances past Cricket’s club finals miracle grab. Was the closest margin of victory on the men’s side evidence of a brutally tough draw for both nominees or should Mehta’s circus catch be worried moving forward? Froude’s double-dose of dirty layouts at Regionals cruised past Alan Kolick’s own high-flying escapades. Time to see if he can knock of his second straight pro game opponent. Age beat out youth in the first round matchup of two World Championship title game grabs, with Matsuno’s WUGC sky topping Joe Freund’s WJUC-clinching catch en route to the biggest victory of the first round. The Japanese talisman now takes on another young American ace in the quarterfinals. Matthews’ incredible balance and footwork was enough to get by Jack Williams’ shoulder-high layout, but it will be enough for the Ego star to overcome the aerial prowess of Matsuno in the next round? The narrowest win of the first round saw Knowles’ double-game-point winner survive Cassie Wong’s absurd athleticism. It’s tough to top the moment of a game-winning layout at Club Nationals, but Knowles’ next opponent just topped a grab that clinched a college semifinal victory. Just as with Connor Matthews above, Lozano’s fancy footwork at College Nationals was enough to advance the Whitman star to the quarterfinals of our bracket. After the Sweets’ run to the finals in Raleigh, can Lozano keep alive a repeat performance in our bracket? If it’s good enough for Sportscenter, it’s good enough for Ultiworld’s readers. Beth Kaylor’s All-Star Tour flying demonstration landed her at #8 on ESPN’s Top 10 list back in July; one more victory here guarantees an even higher finish in our year-end competition. In Round 1, Stern saw off her Seattle sister, Claire Trop, in a battle between two massive bids in big games. The Riot star’s form in her highlight shares even more striking similarities to the grab made by her quarterfinal opponent, Kaylor. 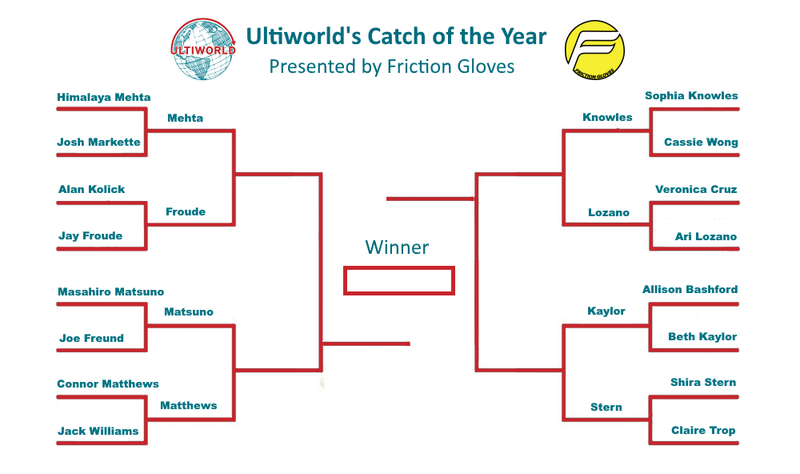 Comments on "Round 2 Of Ultiworld’s Catch Of The Year Bracket, Presented By Friction Gloves"